Manchester, in the north-west of England, is known for its abundance of nightlife and daytime entertainment. This popular destination is also a mecca for thrill-seekers and as such, it boasts some of the most impressive indoor and outdoor go karting tracks in the whole of England. Both serious racers and first-timers can easily book an Arrive and Drive day, while stag party and hen party groups will love the hair-raising challenge of circuits offering hairpin bends, flyovers, tunnels, and Gran Prix-style races. Go karting tracks are also an excellent choice for companies wanting to improve team morale, entertain corporate clients, and improve management/staff relationships. Many of our Manchester venues take bookings for corporate karting events and team building activities, catering for small, medium, and large groups. 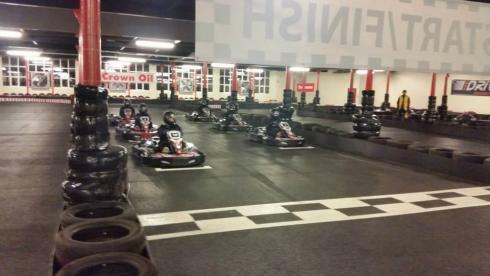 Go karting-themed kids birthday parties are also a star attraction at many courses, like Daytona Manchester – an indoor, heated stadium based close to the Old Trafford football ground. Whatever the weather or time of year, children aged 5 to 15 can enjoy the thrill of junior karting, or register at Daytona’s Race School which teaches all the aspects of cadet karting via a series of structured training modules. Members of cadet karting clubs often get to take part in in-club championships, and events are normally scheduled for weekends and school holidays so that your child can make the most of his or her free time. If you’d rather experience a more authentic Formula One race on an exhilarating outdoor circuit, Karting 2000 in Gorton specialises in a variety of event types for both adults and youngsters, including team building, corporate karting events, Arrive and Drive, junior karting, kids birthday parties, hen party and stag party experiences, and other special celebrations. Get the ball rolling and the wheels turning by browsing our Manchester track directory today.